You are here: Home > If correlation is not causation, what is? 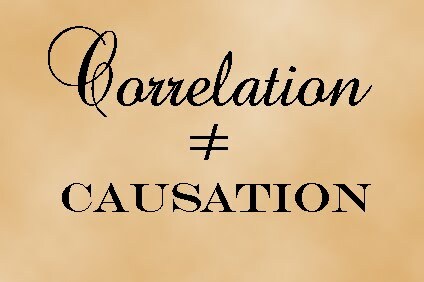 If correlation is not causation, what is? Even those who can’t tell the difference between a t-test and a chi-square are familiar with a basic principle of epidemiology: correlation does not equal causation. In other words, even if Event A happened before Disease B, it does not mean that A caused B. For example, in last 100 years deaths from infectious diseases has declined precipitously. During the same time span, the recreational use of marijuana has also increased. Yet no one would suggest that the decline in infectious disease deaths was caused by smoking marijuana. So if correlation does not equal causation, what does? To determine if Event A caused Disease B, we need to investigate whether it satisfies Hill’s Criteria. These are 9 criteria, most of which much be satisfied before we can conclude that Event A is not merely correlated with Disease B, but Event A actually causes Disease B. Who was Hill and why should we care about his criteria? … These criteria were originally presented by Austin Bradford Hill (1897-1991), a British medical statistician as a way of determining the causal link between a specific factor (e.g., cigarette smoking) and a disease (such as emphysema or lung cancer)… [T]he principles set forth by Hill form the basis of evaluation used in all modern scientific research… Hill’s Criteria simply provides an additional valuable measure by which to evaluate the many theories and explanations proposed within the social sciences. 1. Temporal relationship: It may sound obvious, but if Event A causes Disease B, Event A must occur before Disease B. The is the only absolutely essential criterion, but it is NOT sufficient. Lay people often erroneously assume that because it’s the only essential criterion, it is the only criterion that counts. For example, vaccine rejectionists often point to the fact that childhood vaccinations usually occur before the onset of autism, but that does not mean that vaccination causes autism. Consider that learning to walk usually precedes autism, but obviously learning to walk does not cause autism. 2. Strength: This is measured by statistical tests, but can be thought of as similar to the closeness of the relationship. Is Disease B always preceded by Event A? Sometimes? Only rarely? Does Event A always cause Disease B? Sometimes? Only rarely? Lung cancer is not always preceded by cigarette smoking, but it usually is. Cigarette smoking does not always lead to lung cancer, but it does often lead to lung cancer. In other words, the relationship is fairly strong. In the case of vaccines and autism, vaccines usually precede the diagnosis. However, most children who receive vaccines don’t develop autism. Thus the relationship is weaker. 3. Dose-response relationship: If cigarette smoking causes lung cancer, we would expect that smoking more cigarettes would increase the risk of lung cancer, which it does. In contrast, there appears to be no dose-response relationship between the number of vaccinations and the risk of developing autism. 4. Consistency: Have the findings that purported to show a relationship been replicated by other scientists, in other populations and at other times? If studies fail to consistently show the relationship, causation is very unlikely. This is a critical point. One experiment or even a few experiments is NOT enough to determine causation. A large number of experiments that consistently show the same result is required. This is particularly important for vaccine rejectionists to note. The fact that a few studies claim to have shown that vaccination causes autism is meaningless when a very high proportion of studies show that there is not even a correlation between vaccination and autism. 5. Plausibility: In order to claim causation, you MUST offer a plausible mechanism. In the case of cigarette smoking, certain components of the smoke are known to cause damage to the cells inside the lungs, and cellular damage has been shown to lead to cancer. In contrast, no one has yet offered a plausible explanation for how vaccines “cause” autism. In fact, no one can even agree on the specific component that is supposedly responsible. 6. Consideration of alternative explanations: This is self explanatory. In the case of vaccination and autism, there is a very simple alternative explanation. Autism cannot be diagnosed before the age of 2 and most vaccines are given before the age of 2. 7. Experiment: If you alter Event A do you still get Disease B. In the case of smoking, if you quite smoking, the risk of lung cancer goes down. In the case of vaccines and autism, if you forgo vaccination, the risk of autism remains unchanged. 8. Specificity: Is Event A the only thing that leads to Disease B? This is the least important of the criterion. If it is present, it is a very powerful indicator of causation. For example, among young women who developed a rare form of vaginal cancer, all of them were found to have been exposed to DES (diethylstilbestrol) while in utero. That is a highly specific effect. However, even if the relationship is not highly specific, that does not preclude causation. Though there are non-smokers who get lung cancer, it does not change the fact that the other criteria show that smoking causes lung cancer. 9. Coherence: The explanation of action must comport with the known laws of science. If the purported mechanism of causation violates the law of gravity, for example, then it isn’t acceptable. That’s why religious arguments against evolution are wrong. They are “incoherent” since they invoke forces outside science. What do Hill’s criteria look like in action? In the case of cigarette smoking and lung cancer, 8 out of 9 Hill’s Criteria are satisfied. In contrast, in the case of vaccines and autism, only 3, possibly 4 criteria are satisfied. This is why we can say that the scientific evidence shows that vaccines do not cause autism. While it is true that vaccinations usually precede the diagnosis of autism, that is an essential criterion, but not enough. The fact that there is no dose-response relationship, that the few studies that showed a purported relationship cannot be replicated and that studies in which people who were not vaccinated did not have a lower incidence of autism, demonstrates that vaccines do not cause autism. ← Are vaccine rejectionists killers?